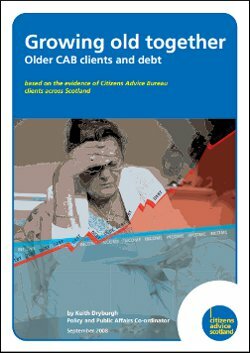 Evidence report which looks at the impact of debt on older CAB clients. CAB debt clients over the age of 60 are increasingly struggling with excessive debt. The ‘baby boom’ generation is approaching retirement and is bringing their many forms of credit and debt with them into their pension years. In many ways, this is a new and growing phenomenon. Pensioners have often struggled to live on their relatively small incomes, but many are now faced with the prospect of trying to finance large debts on a small income.